NASA marked a major milestone Friday on its journey to Mars as the Orion spacecraft completed its first voyage to space, traveling farther than any spacecraft designed for astronauts has been in more than 40 years. During the uncrewed test, Orion traveled twice through the Van Allen belt where it experienced high periods of radiation, and reached an altitude of 3,600 miles above Earth. Orion also hit speeds of 20,000 mph and weathered temperatures approaching 4,000 degrees Fahrenheit as it entered Earth’s atmosphere.Orion blazed into the morning sky at 7:05 a.m. EST, lifting off from Space Launch Complex 37 at Cape Canaveral Air Force Station in Florida on a United Launch Alliance Delta IV Heavy rocket. The Orion crew module splashed down approximately 4.5 hours later in the Pacific Ocean, 600 miles southwest of San Diego. 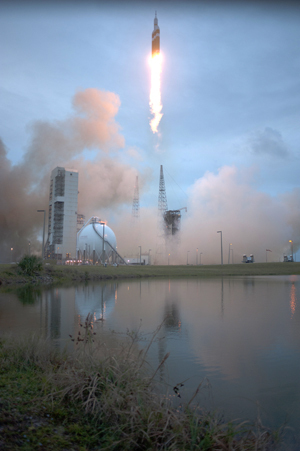 Orion will open the space between Earth and Mars for exploration by astronauts. This proving ground will be invaluable for testing capabilities future human Mars missions will need. The spacecraft was tested in space to allow engineers to collect critical data to evaluate its performance and improve its design. The flight tested Orion’s heat shield, avionics, parachutes, computers and key spacecraft separation events, exercising many of the systems critical to the safety of astronauts who will travel in Orion. “We really pushed Orion as much as we could to give us real data that we can use to improve Orion’s design going forward,” said Mark Geyer, Orion Program manager. “In the coming weeks and months we’ll be taking a look at that invaluable information and applying lessons learned to the next Orion spacecraft already in production for the first mission atop the Space Launch System rocket.”On future missions, Orion will launch on NASA’s Space Launch System (SLS) heavy-lift rocket currently being developed at the agency’s Marshall Space Flight Center in Huntsville, Alabama. A 70 metric-ton (77 ton) SLS will send Orion to a distant retrograde orbit around the moon on Exploration Mission-1 in the first test of the fully integrated Orion and SLS system. A team of NASA, U.S. Navy and Lockheed Martin personnel aboard the USS Anchorage are in the process of recovering Orion and will return it to U.S. Naval Base San Diego in the coming days. Orion will then be delivered to NASA’s Kennedy Space Center in Florida, where it will be processed. The crew module will be refurbished for use in Ascent Abort-2 in 2018, a test of Orion’s launch abort system. Lockheed Martin, NASA’s prime contractor for Orion, began manufacturing the Orion crew module in 2011 and delivered it in July 2012 to the Neil Armstrong Operations & Checkout Facility at Kennedy where final assembly, integration and testing were completed. More than 1,000 companies across the country manufactured or contributed elements to Orion.